June | 2008 | NICE! 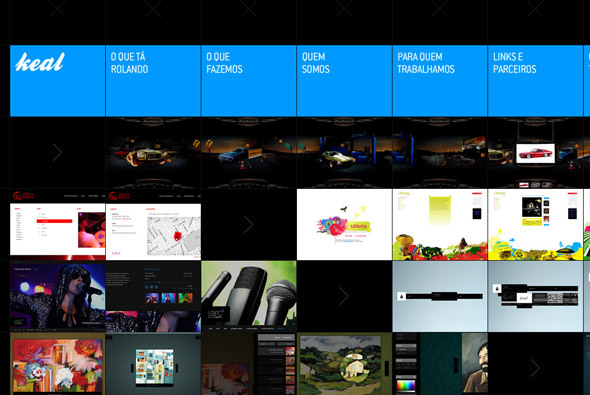 Interesting site of Brazilian agency Keal. Nice take on the panning & scrolling navigation interface – the menu is also inlcuded which quite cool. Some good work too, nice touches and attention to detail, clean, crisp and modern. 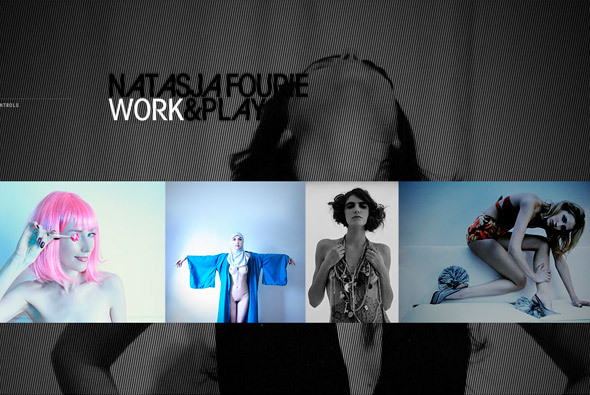 Very stylish portfolio site of photographer Nastasja Fourie, great work, great site. Divided by ‘work’ and ‘play’ sections to display a collection of photographs. Slightly pretentious intro, but once past that, there is a nice soundtrack and sound fx, a motion design feel to it, lots of nice effects and transitions – all stylish. Really like the amount of animation and attention to detail throughout the site – really provides a nice presentation to the work. 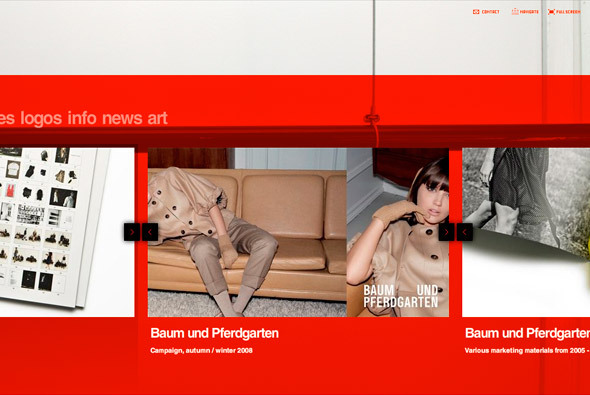 Nice site of Danish design company DesignBolaget. Presented in an interesting way, the items of work are scrolled along, and enlarged – nothing ground breaking but fun, structured well and it looks good. Nice rollovers, navigation and style. Beautiful, stunning work! Not quite sure what it is for – but it is inspiring you to take better care of the environment. Just simply an amazing website. Built around a cut out concept where the stories of various characters are told, through a cut out look and feel executed in a 3d fashion. When you click on a character your view zooms to the pop up book of their story, the beauty of it is the panning and rotating of the camera around the book, there is a huge attention to detail – by rotating the view you can see more details and explore the scene. I love the concept and the look and feel of the whole site, it is truly inspiring – where technology and design meet in unison – the 3d element is smooth and perfectly executed, the visuals are great and fun. Created by the ultra talented Masayuki Kido, known as ROXIK – of Pictaps fame. He used his own 3d engine ‘Sharikura’. 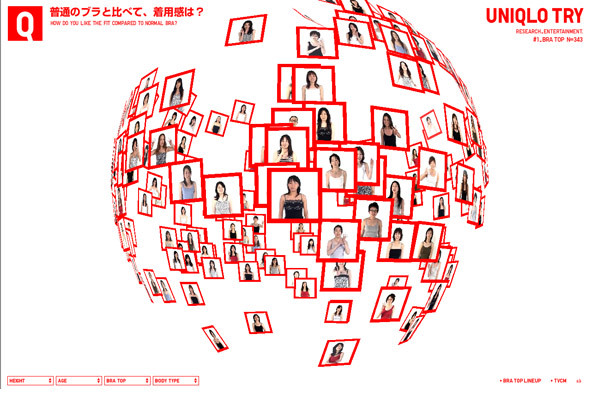 Wow, another amazing Japanese website for Uniqlo – the presentation of opinions of 343 customers to a bra Uniqlo make! The work created for Uniqlo has been consistently amazing, always technically brilliant backed up with a nice concept. This is another example of that, instead of producing something simple & boring, something that is essentially about a survey, a fantastic 3d representation of opinions has been created. Floating through the opinions the way the data is presented is constantly flowing from one state to another, making new 3d shapes, and morphing colours. I really like the crisp presentation coupled with the smooth transitions and fast performance of the site. Technically proficient and well executed to present a really enjoyable user experience. I have long been a fan of Japanese web design and its really good to see so many amazing sites appearing. The mix of music, technical excellence, and simple layouts provide the fun, colourful, and enjoyable approach that is often common place in Japanese designs. So often the more imaginative, conceptual side of web design is ignored for the slicker, polished look and feel, it is so refreshing to see a different viewpoint. 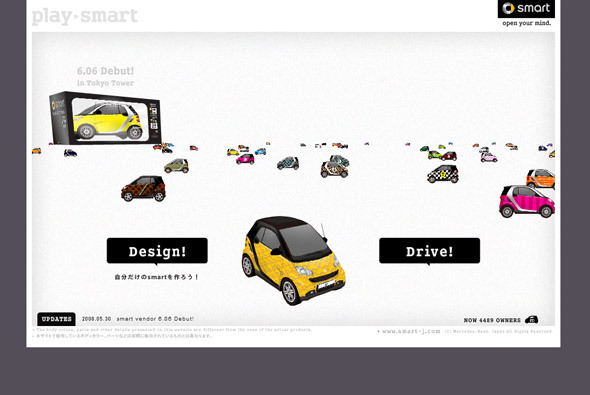 Another great Japanese website, this time promoting the Smart car in Japan. In 3d you can design and drive your own Smart car, the great thing about the driving part is the way it is thought out. Presented in a ‘join the dots’ fashion, you drive your car from point to point, when completed the camera zooms out to reveal the picture you have just made, you can then download it or try again. There are several puzzles to complete and you get points to unlock design parts for your car. This is all set in a fun, easy to use look and feel, just a fun well thought out and executed site. Similar in many ways to the Red Bull Flightlab. 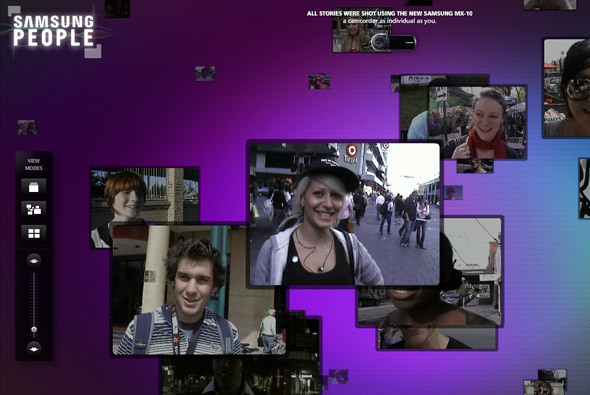 Site promoting Samsung’s MX-10 camcorder – hundreds of people were asked ‘Where is your mind?’, this site shows the results. A nice scrolling interface to display the various videos, which you can view in different ways. Good attention to detail and nice transitions and effects.